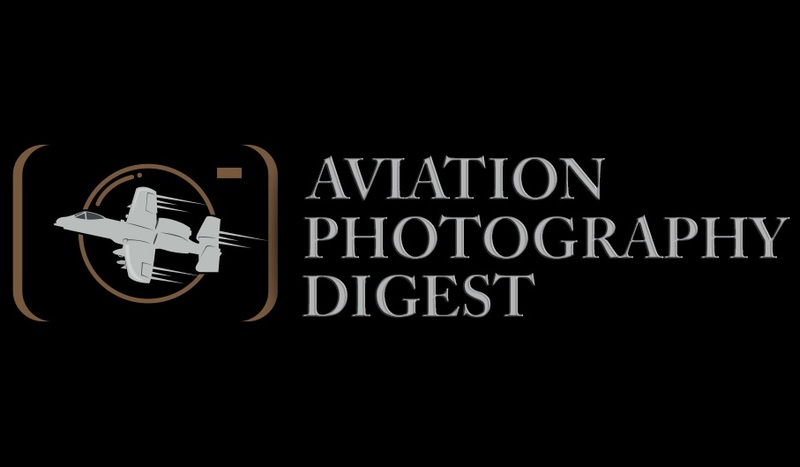 Todd Miller of Aviation Photography Digest visits the 4th FW at Seymour Johnson AFB to report on “Razor Talon,” a monthly large force, east coast exercise sponsored by the USAF. he humidity and heat are palpable as the sun beats down on the ramp area at Seymour Johnson AFB in Goldsboro, NC. The atmosphere is purely electric as we stand in the midst of nearly 100 F-15E Strike Eagles. The USAF’s premier deep strike/interdiction aircraft are everywhere. There is an intensity that feels part hornets nest, part the gathering of wolves prior to the hunt. Engines whining at idle the smell of jet fuel in the air, ground crews move in and around ensuring all aspects of the aircraft are in mission order. 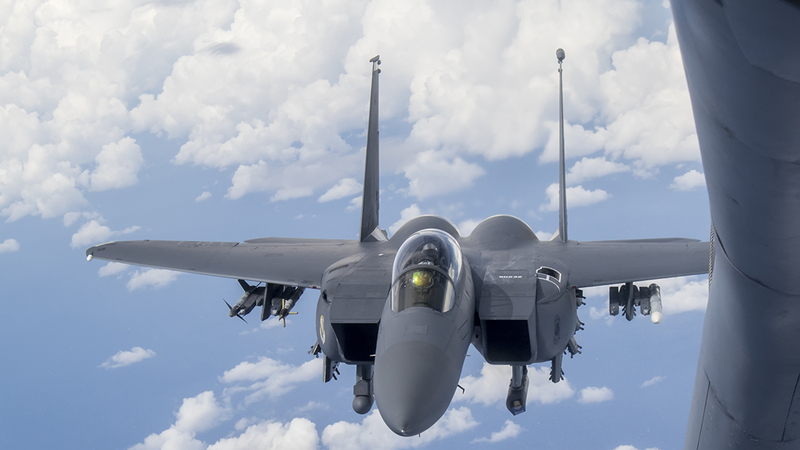 The purpose of the Strike Eagle is undisputed, to put the smack down on enemy ground targets, to bring the boom to the bad guys. One look at these birds, and you can feel it – they are the “Hammer” in the fight. It is 9/11/15 and I stand in front of the 4th Fighter Wing’s “Wing Jet” with special markings invoking the words that embodied the first response of Americans to the day of terror, “Let’s Roll!” It puts today’s Razor Talon exercise in the greater context of the war on terror that has kept our forces so busy, and relied so heavily on the Strike Eagles. 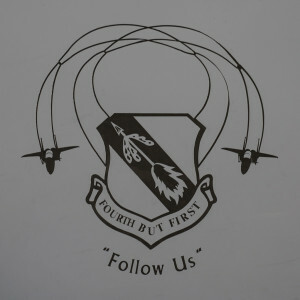 The 4th FW, as represented at Seymour Johnson AFB is comprised of the 333rd and 334th Fighter Squadrons (the sole training units for the F-15E) and the 335th and 336th Fighter Squadrons. 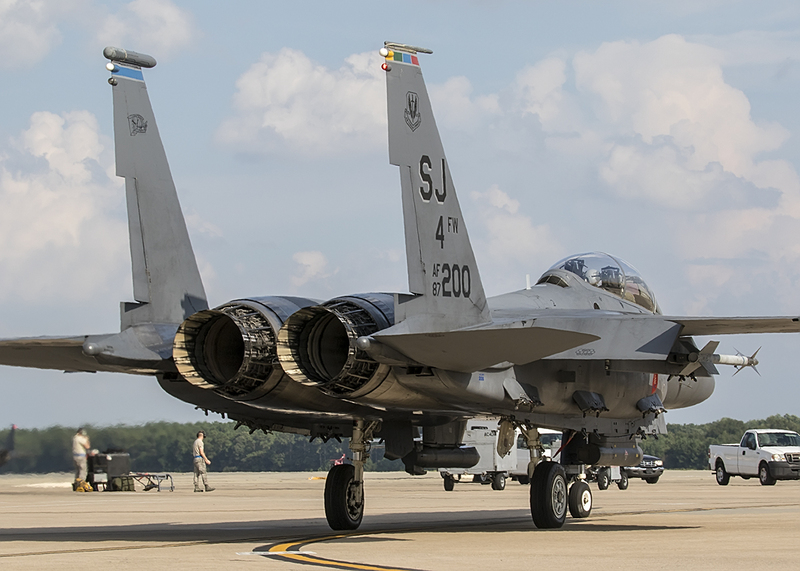 The 335th and 336th Fighter Squadrons are operational units that respond to secure and defend the national interests of the United States on a global scale. The squadrons employ conventional and precision weapons against targets in strategic attack, interdiction, counter air and offensive air support roles. The 335th FS “Chiefs” were nicknamed “SCUD BUSTERS” for their role in finding and destroying Iraq’s SCUD missile launchers during the first Gulf War in 1991, and they made aerial warfare history by downing an Iraqi helicopter in the air using a laser-guided bomb! * (US Air Force Fact Sheet). 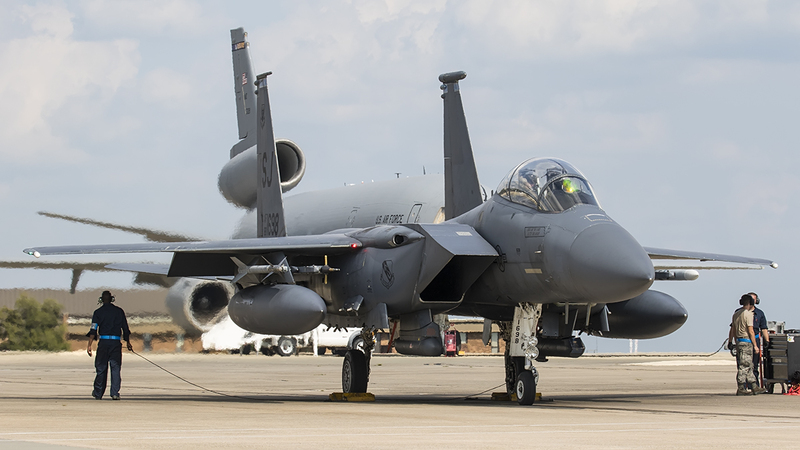 Bottom line – it is a very bad idea to put yourself on the wrong side of a Strike Eagle squadron! 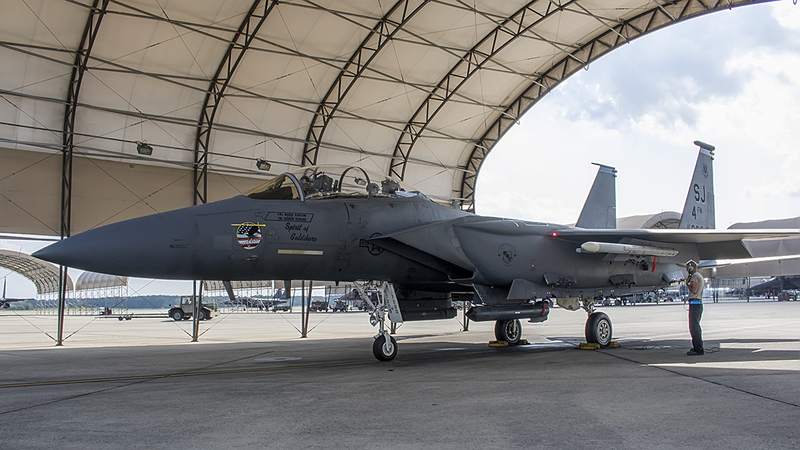 Just feet away, Strike Eagle pilots and weapon system operators (WSO) are going through systems checks, reviewing mission notes and communicating potential tactics with hand gestures. Military patience sets in as the Eagles wait for the “go” to taxi to the end of runway (EOR) for final checks and ordinance arming. The natural heat of the tarmac is aggravated by gusts of wind that blow waves of heat from the idling engines. Regardless, it is a privileged place to visit, standing at the center of a gathering storm soon to engulf targets on and around the North Carolina coast. The ground crew steps forward and the pilot’s attention shifts, it is time to roll. With a “hang loose” from the pilot, visors drop and ground crew moves aside. The pilots Joint Helmet Mounted Cueing System (JHMCS) make X-Wing pilots of Star Wars look very dated, and as the Eagles roll I find myself hearing “Thunderstruck” by the band AC/DC drumming away in my mind. There are few places where young people get more responsibility and opportunity than serving in the armed forces. 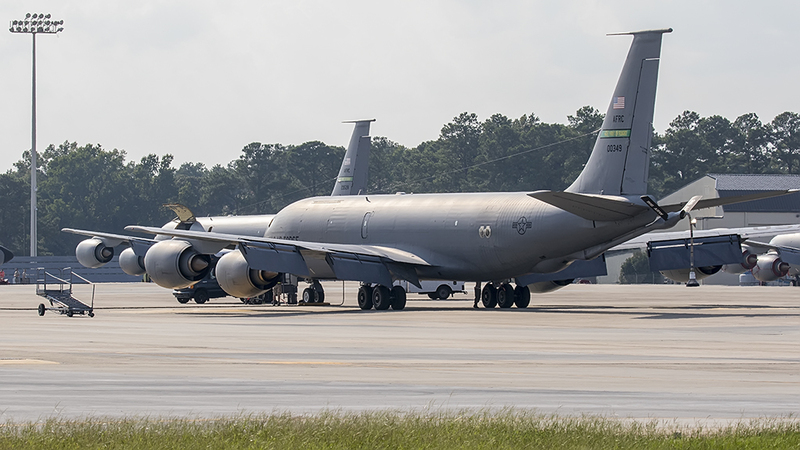 The relatively large CFM-56 turbofans of the KC-135R have an abundance of power and the tanker lifted off effortlessly and climbed quickly to its refueling position off the North Carolina coast. One of three tankers launched to support aircraft participating in the Razor Talon exercise, #0294 would also include some boom training of Airman 1C Gradney-McCastle. The young A1C had plenty of experience fueling large aircraft, however this would be his first time refueling fighter aircraft. A very experienced TSgt Montani was in place to demonstrate, supervise and coach every move and we’d have the opportunity to observe. I look through one of the few hazy windows on the left side of the fuselage of the KC-135R to see our first visitors, two Raptors in formation off our left wing. 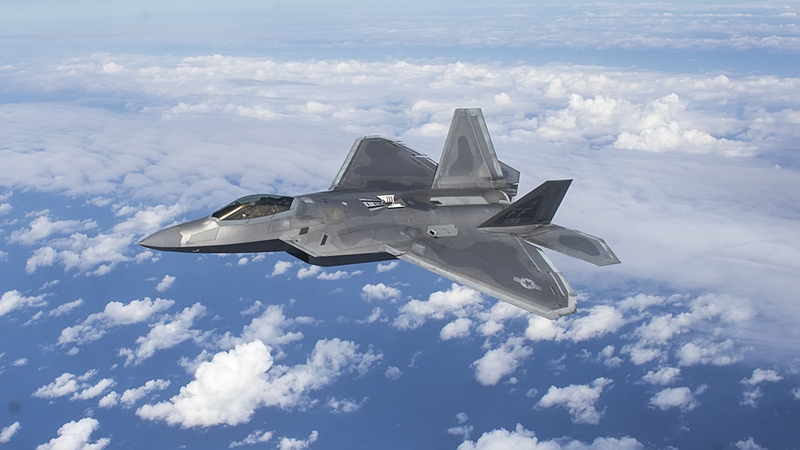 As fortune has its way, the first aircraft that would test the A1C would be the USAF’s premier air superiority fighter, the F-22A Raptor! 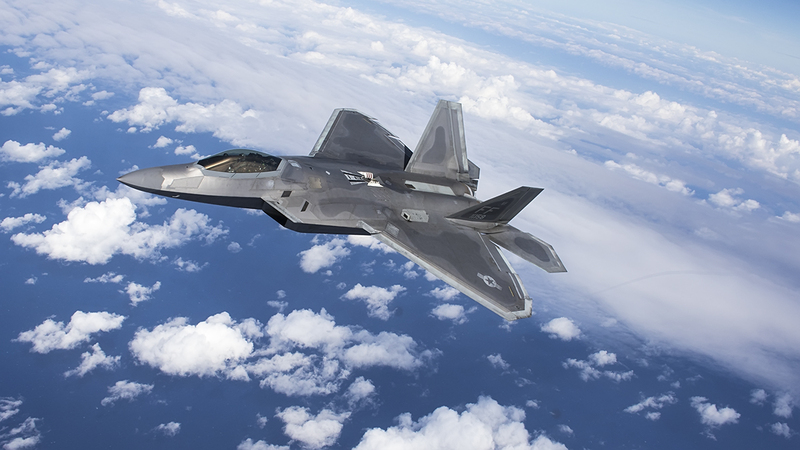 With an estimated unit cost of $160M, the Raptor is as impressive as it is mysterious. 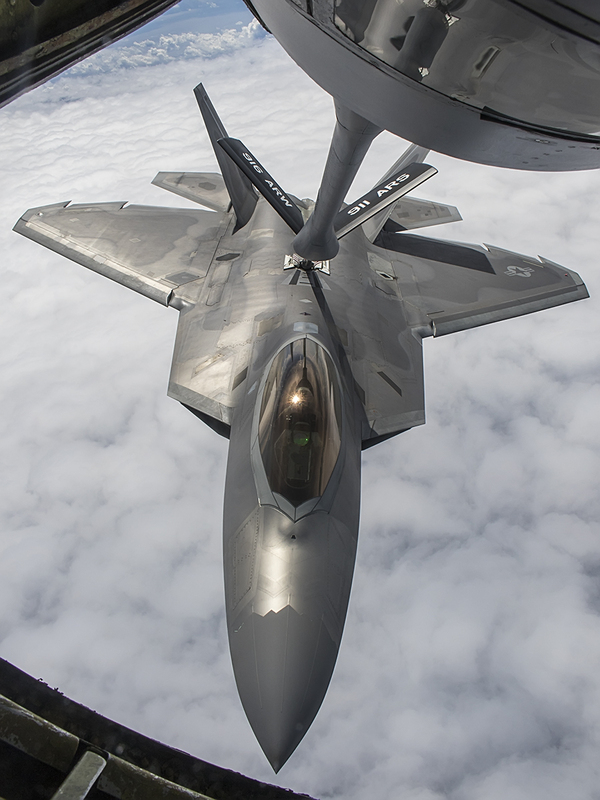 The pilot of the Raptor effortlessly brings his ride into position under the tanker, and the boom operator begins to initiate contact to refuel the aircraft. 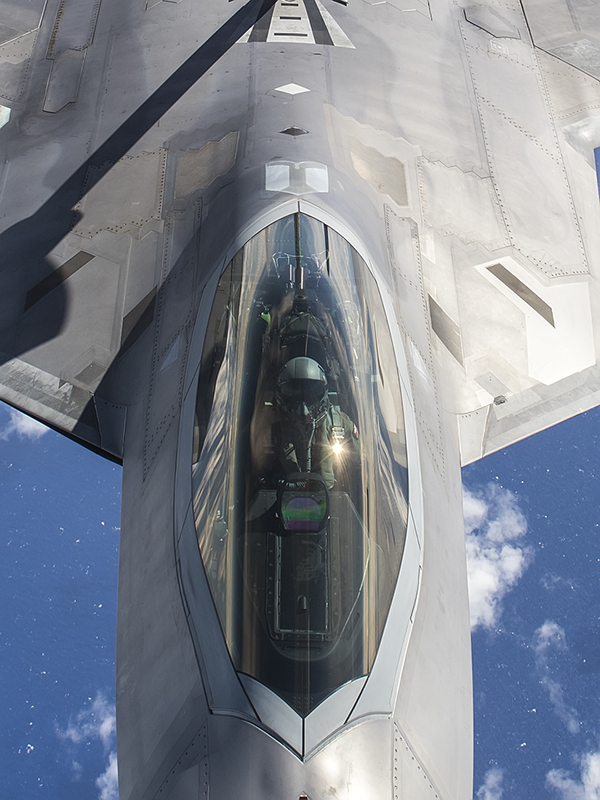 Given the F-22A sports a specialized radar absorbing coating, the TSgt’s words “Whatever you do, don’t scratch it!” were appropriate, if not just a little intimidating. 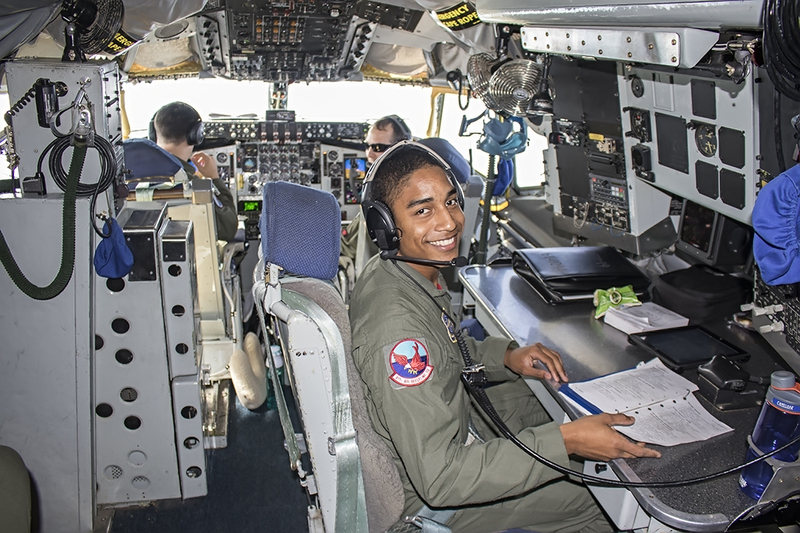 Not to be concerned, given the training and support structure the A1C performed flawlessly and the TSgt frequently encouraged, “perfect,” “nice job!” The two remained focused (no small feat given photographers working nearby) and handled the entire exercise with poise and precision. After the Raptors fueled and assembled on the right wing of the tanker they begin to climb, soaring up and away. Just before disappearing, vapor streamed from their wingtips as they turned into the fight. 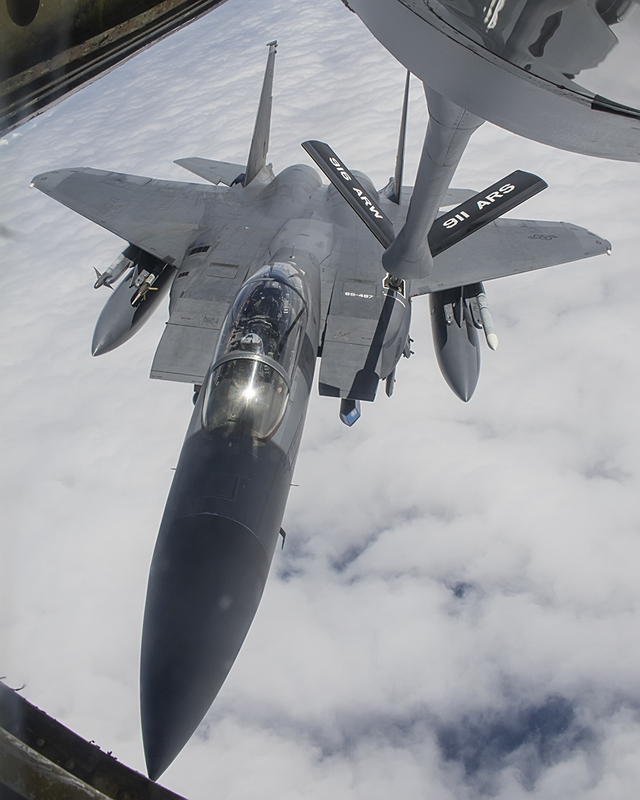 Tanker #0294 would be visited by the F-22A Raptors of the 27th FS and F-15E Strike Eagles of the 335th FS, with F-16CM Vipers and other participating aircraft getting their fuel from one of the other orbiting tankers. Laying prone at the boom station, the comms crackle that “strikers” are inbound for gas. Orbiting about 25,000 ft above the water, I scan the sky and pick them up at some distance well below us. Cutting through the sky with grace the first Eagle climbs effortlessly to our left wing. Soon the second Eagle comes straight in behind us, a little low and to the left. Another beautiful, purpose built machine takes fuel with the reflection of the tanker captured perfectly in the Strike Pilot’s visor. After fueling the Strike Eagles drop back down to their domain, and I lose sight of them straight below the tanker at some distance. The reference point the tanker provides makes the fighters appear to sail the skies with ease and impunity. Captain C. Hinkley, Chief of Weapons for 335th FS (the Chiefs) describes what it means to be a pilot of the F-15E, “it is the fulfillment of a childhood dream, service of one’s country and protecting your own team on the ground.” I understand it on an intellectual level, but am left a distant spectator as he and team so effortlessly cut up the sky, purposefully evading detection on a deep strike mission that results in successful destruction of their target. After about 3 hours in the air, it is time to return to Seymour Johnson AFB. 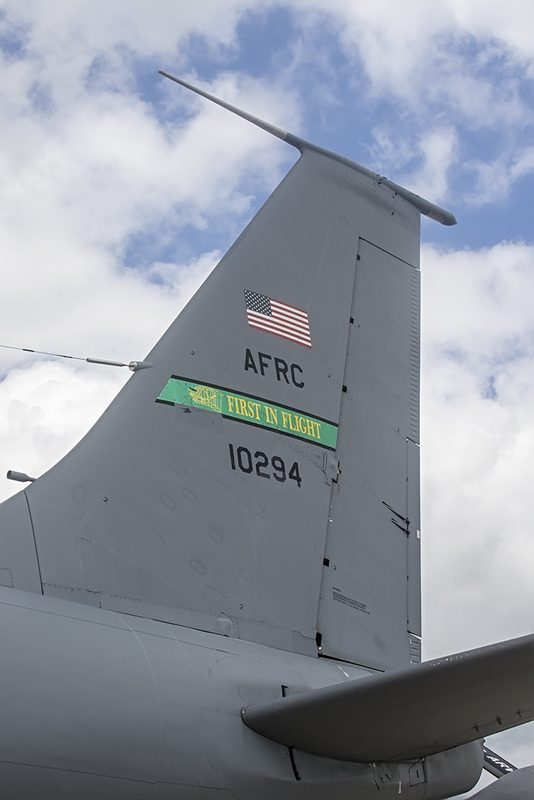 Upon landing those CFM-56s provide something for the KC-135R flight crews to keep in mind – a relatively low 18” of ground clearance on the inboard stations. While generally not an issue, it is relevant to note in strong crosswinds or rough weather as the KC-135R does require a near “wings level” landing to avoid an engine ground strike. Not an issue this day given the flight crew makes a flawless landing. 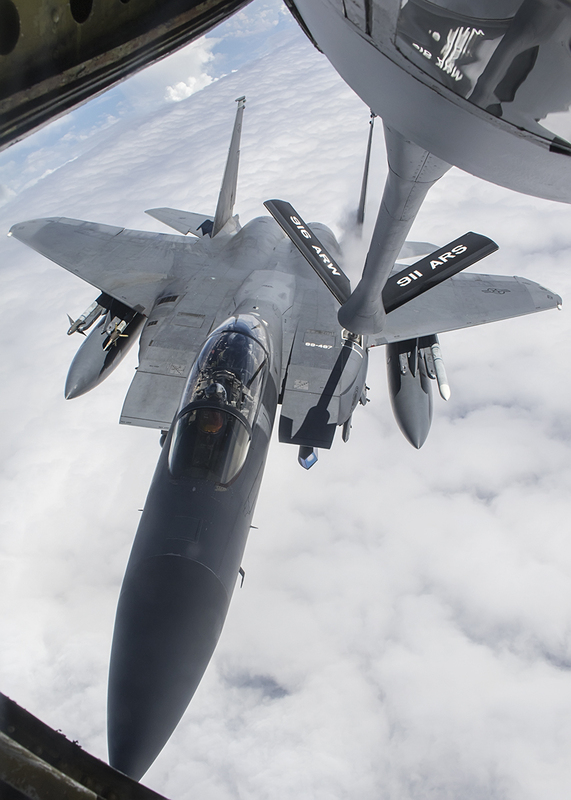 Throughout the flight the crew worked together like a “well-oiled machine,” making such a critical role of providing fuel to the war fighters look routine. Beyond the flight performance, the crew demonstrates exceptional graciousness and accommodation. It is always a privilege to interact with our service members. 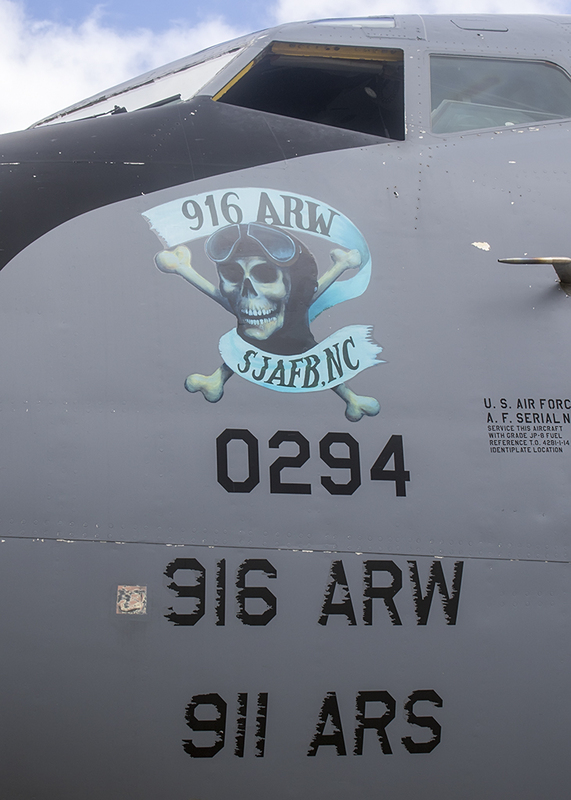 911 Air Refueling Squadron (ARS) of the 916th Air Refueling Wing (ARW). Further north at Langley AFB, Raptors gather. The “cloaked bird of prey,” unseen and unmatched it dominates the skies with ruthless efficiency. Exercise after exercise has fighter pilots of all nations expressing their frustration with fighting the Raptor – “we are shot down before we even know they are there,” “even when we see them, we cannot get a lock on them.” The Raptor is exclusive to Blue Air, with Blue Air pilots remarking it would make the exercise very difficult if they had to fight through a force of F-22s to their targets! The KC-135R tankers are in the air, and Red Air moves on station with the unenviable task to thwart this incoming storm. They will fight to protect their airspace, ground assets, Sam sites and naval forces. They are representative of any number of nations that that the US might confront in the real world. 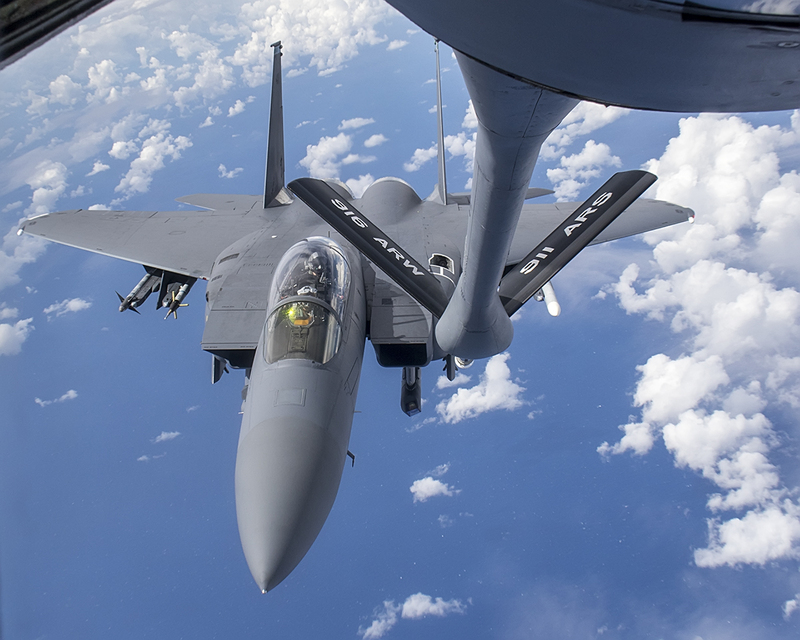 This is Razor Talon, a monthly aerial warfare exercise that represents a tremendous “win” for the USAF, both in terms of cost efficiencies and proficiency gains. Razor Talon was primarily designed for three core Wings, the 4th FW of Seymour Johnson AFB, the 1st FW of Langley AFB and the 20th FW of Shaw AFB. In this particular Razor Talon, those units are represented, and joined by the T-38C Talon, RC-135, E-3 AWACS, and E-8 JSTARS platforms. Capt. Eichel indicated that Razor Talon typically involves 50-60 aircraft, with 35-40 on Blue Air and 20-25 on Red Air (though the exercise we participate in is a little smaller with 30 aircraft). Given the location and scope, the exercise offers tremendous flexibility and opportunity, often including units from the Marines (MCAS Cherry Point), Navy (NAS Oceana) as well as Army, Special Operations Forces, Coast Guard, Interagency assets. 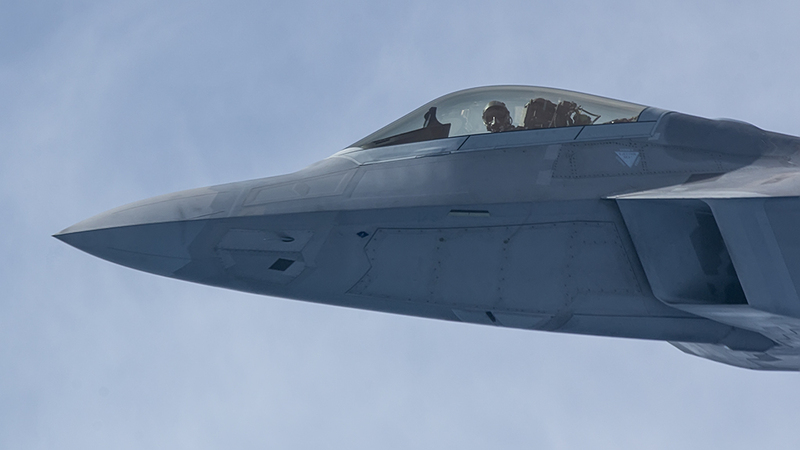 During Razor Talon the F-22A and F-16CM typically fly as Blue Air. T-38C Talon adversary aircraft from Langley AFB fly Red Air in conjunction with designated F-16s and F-15s. Many mistakenly disregard the role of the T-38C as a Red Air asset. The fight for air dominance is primarily a fight achieved beyond visual range (BVR) and the T-38C is reflective of many potential adversaries. The Talons are cost effective, nimble, difficult to spot visually, have a low radar cross section and generate low electromagnetic emissions. They are regularly flown by Raptor pilots looking to exploit what they feel could be a Raptor vulnerability. Needless to say, if a Raptor pilot overlooks a detail, they may receive a well learned lesson – in spite of the platforms dominance. Razor Talon represents a natural progression from unit training towards the broader platform integration that takes place in a campaign, or at the ultimate LFE, “Red Flag” held on the Nevada Test and Training Range (NTTR). 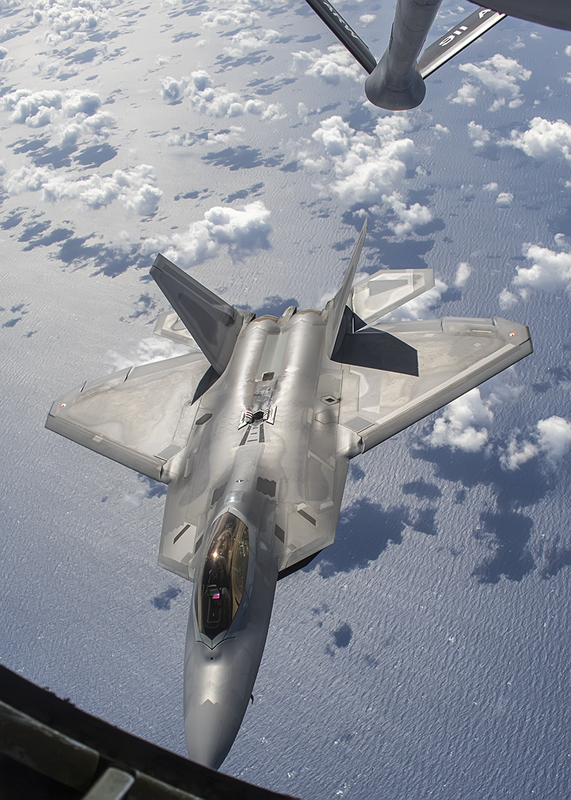 The 2 or 3 week long Red Flag exercise integrates 70 – 100 aircraft and includes a broader variety of platforms in an environment that realistically reflects an aerial warfare campaign against a very capable enemy. Razor Talon includes all the core aspects of Red Flag, albeit on a smaller scale. 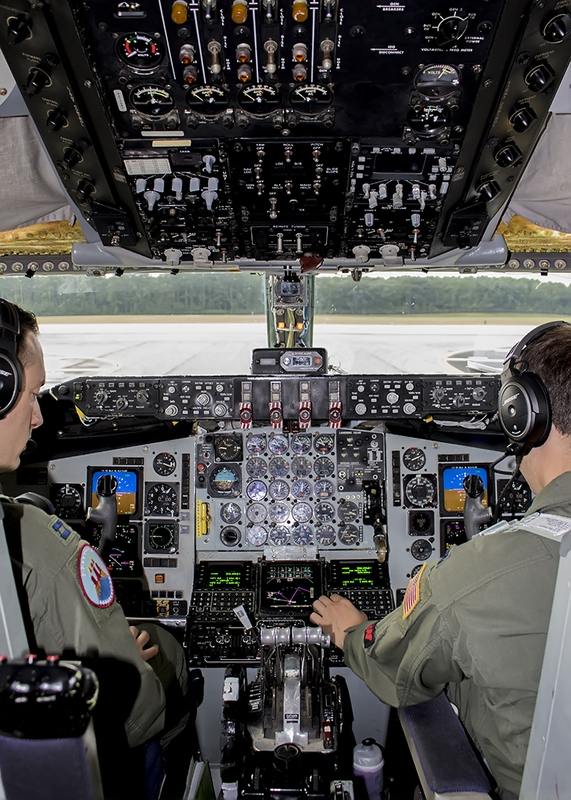 The exercise is monitored real time by “White Force” and includes radar training officers (RTOs) at Seymour Johnson AFB that call air to air kills, personnel positioned at the Mid-Atlantic Electronic Warfare Range (MAEWR) that utilize advanced software to call surface to air kills, and participants call their bomb and AGM-88 HARM impacts. The Dare County electronic combat and bombing range on the northeastern coast of NC is nearby and is utilized for dropping training ordinance. Between the range and other sites there are hundreds of potential targets available for the exercise, including emitters (SAM sites), and naval targets. Razor Talon provides the additional benefit of the realism of a coastal environment, representative of the most likely scenario of a future campaign. Such a campaign would likely utilize a joint maritime deployment, the kind of cooperation seen between the USAF and USN in the evolving “Air Sea Battle” construct. 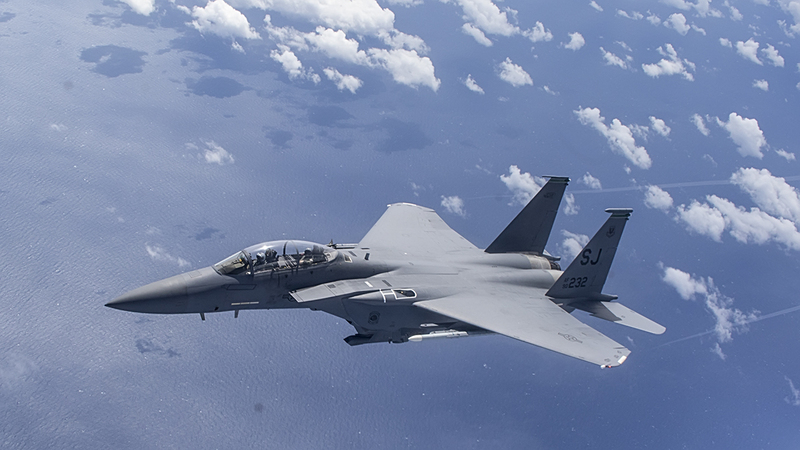 Primary missions tasked during Razor Talon include air superiority, interdiction/deep strike, SEAD, close air support, sea control, defensive counter air, and offensive counter air. Defensive counter air scenarios involve Blue Air defending the coastline from Red Airs attempts to bomb coastal targets. Missions flown on the day had the Strike Eagles of the 335th FS on Blue Air acting as might be more typical, in airborne interdiction. Mission planning identified suitable targets deep in unfriendly territory and the Strike Eagles of the Chiefs proceeded to infiltrate enemy territory, evade detection and drop ordinance on the designated targets. 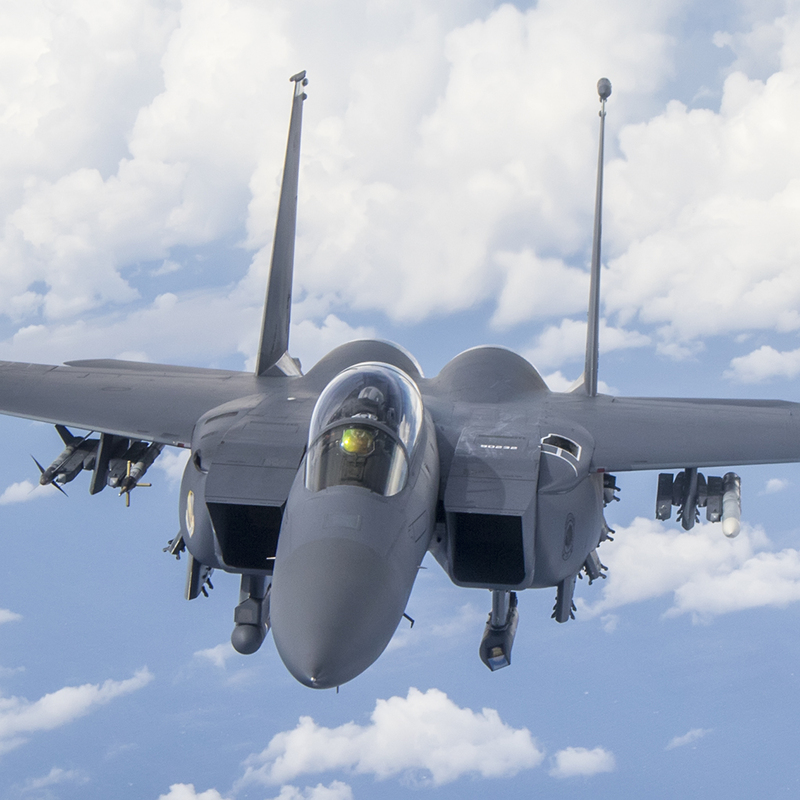 Throughout the F-15E’s interdiction, the F-16CMs were involved in suppression of enemy air defenses (SEAD), and the F-22As addressed any air threats, ensuring air dominance. Once complete, the aircraft were involved in dynamic targeting with the objective to hit naval targets. Razor Talon mission planning starts two days prior to the exercise with the development of the general scenario. The day prior to the exercise sees targets identified on the range, the NC coast and out at sea. The entire group of participants brief together late the day prior to the exercise. 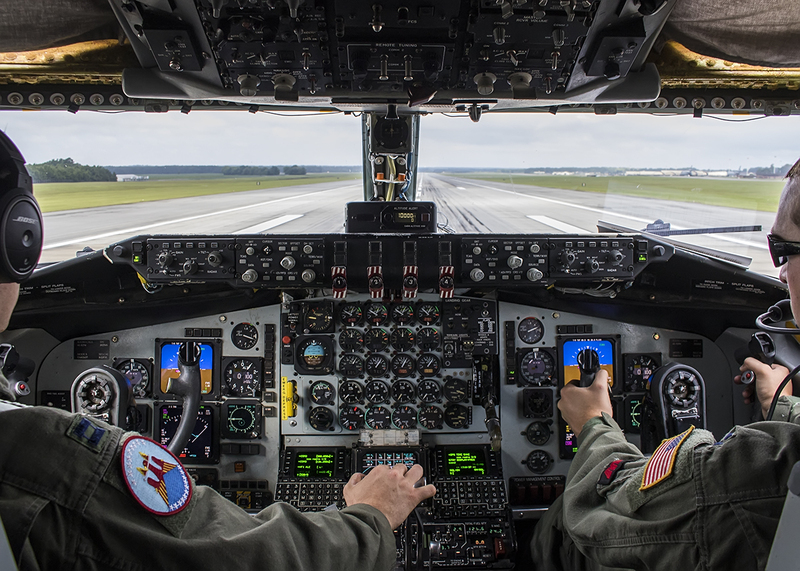 The day of the exercise starts just prior to 6 am with unit specific planning and briefing for three hours, and then to the aircraft for preflight with launch near 10 am for an exercise window of 10:30 – 12:00 pm. Upon landing the unit participates in a 2.5 – 3 hour debrief with the day wrapping up around 4 – 5 pm. A few hours earlier I had watched these flight crews from the 335th FS visit the tanker for fueling post mission, and now I sat in the their club for a short Q&A prior to their debriefing. As it seems it naturally should, the club featured an AMRAAM missile hanging from the ceiling, plenty of images of Air Force leadership and the Strike Eagle in action- a very comfortable place for the Chiefs team to unwind and connect on a social level. 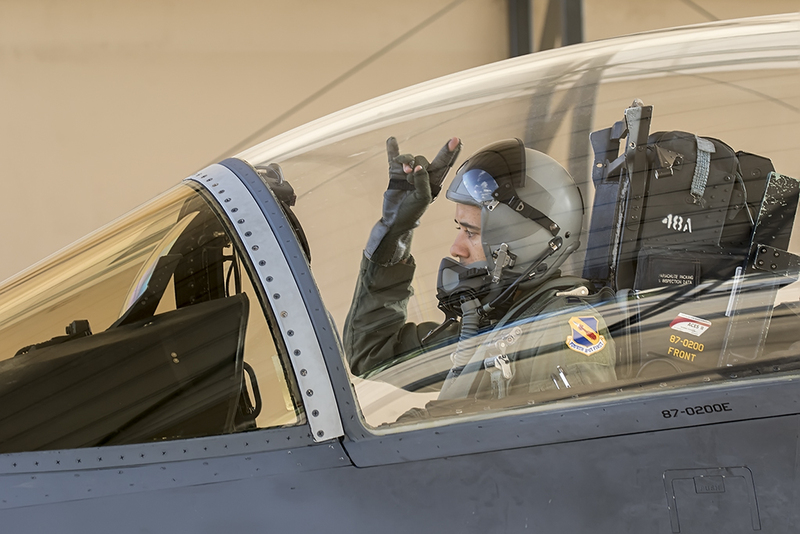 Within seconds 4 Officers appeared representing the 335th FS “Chiefs.” No longer soaring in the skies in F-15Es behind their JHMCS flight gear, the crew now takes human form as focused professionals and gracious hosts. After a couple of minutes discussing the exercise we turn to moments of personal impact experienced by the crews. Not at liberty to discuss operational or deployment in any detail, the officers make an effort to provide insight into their lives flying “the Hammer.” While purpose built for interdiction or deep strike well behind enemy lines, the success of a mission in the real world often has different measure. 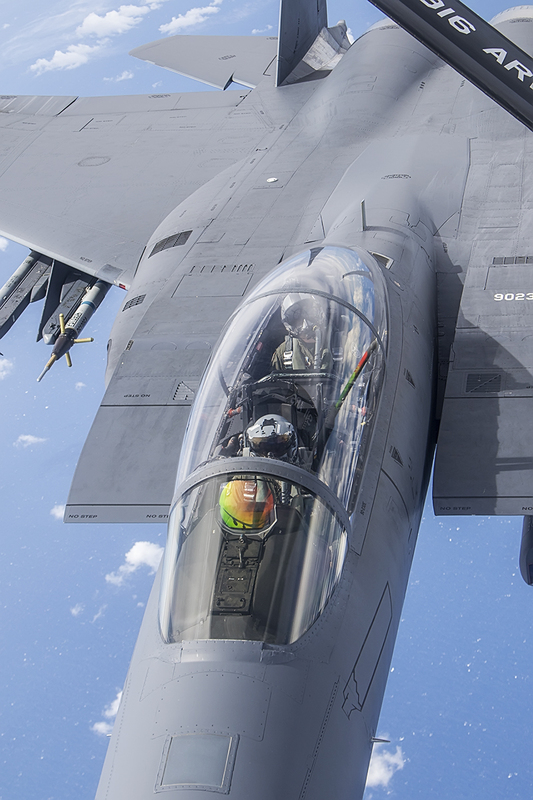 The wide-angle lens of a GoPro helps provide a unique perspective during refueling operations for Razor Talon. 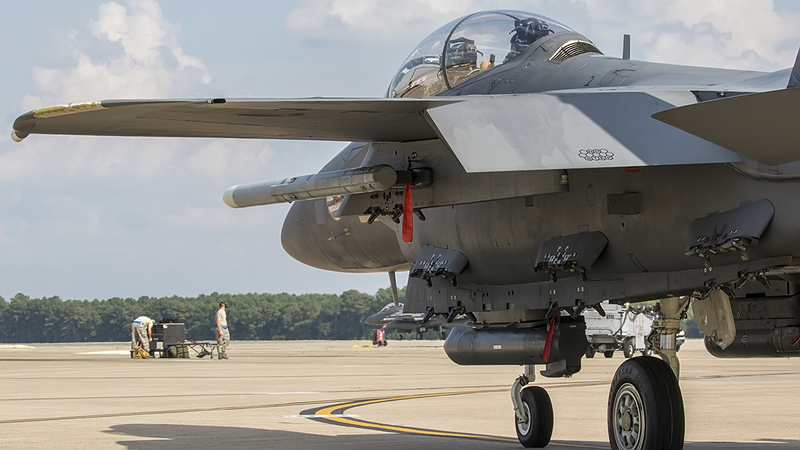 Make no mistake, Strike Eagle pilots and WSOs are trained with one compelling purpose; to destroy ground targets. As such, ultimate gratification takes place in completing a mission that involves driving the nail into the target. Captain “Pain” Eichel shared a confidence building moment, “I was fulfilling a critical requirement of graduation from weapons school (at Nellis AFB & the NTTR) – the live drop. It was the first time I realized a jet the size of a tennis court could be invisible. Dropping into the NTTR on its eastern edge we ingress west fast and low, and in spite of the high threat environment we made it undetected to our target on the west side of the range. 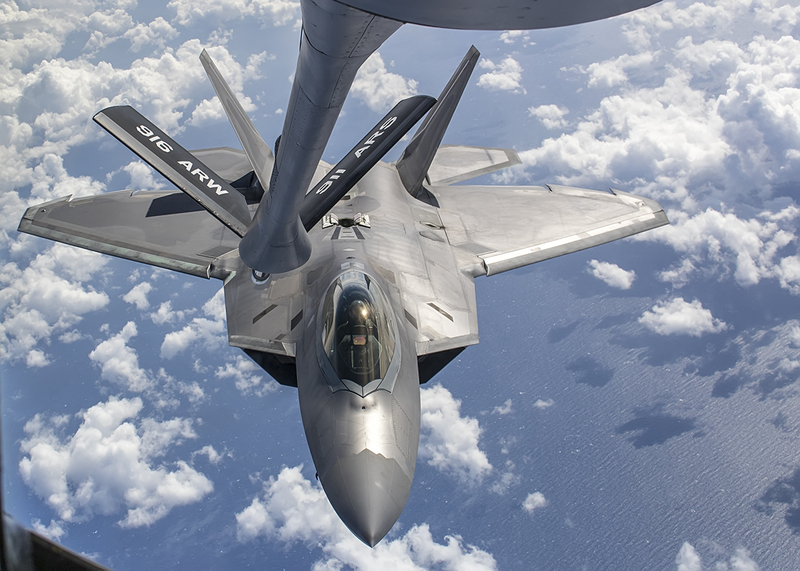 While the preferred outcome of such a powerful force is deterrence, have no doubts, if required the USAF will bring the imposing force of the Hammer, Lightning Bolt, and Cloaked Bird of Prey – and much more to the fight (the sledgehammer, the sword, the nail driver…). Weapons school, daily training cycles, Razor Talon, Red Flag – this is how the USAF trains like it fights, and why the military forces of the US remain the most capable and prepared force on the planet. Special thanks to TSgt. Phillip Butterfield USAF ACC 4 FW/PA, MSgt. Wendy Lopedote USAFR Superintendent Public Affairs, the KC135R crew from the 911 ARS and F-15E crews from the 4th FW, 335 FS “Chiefs,” Captain C. Hinkley, Captain M. Eichel, Captain D. Martin and Captain W. Maulsby. 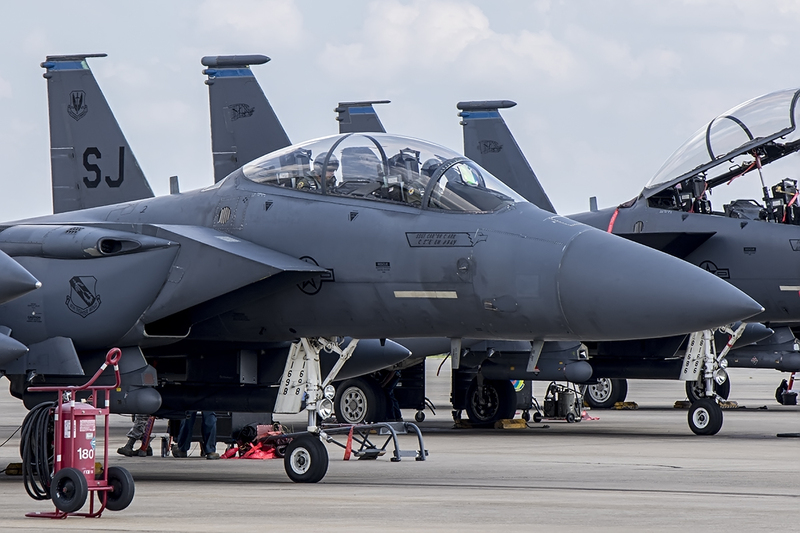 F-15Es of 4th FW Seymour Johnson AFB staged for launch. F-15E 4th FW 334 FS waiting for "go" to taxi to EOR and launch for training sortie. KC-10 Extender in background. F-15E 4th FW 334 FS waiting for "go" to taxi to EOR and launch for training sortie. 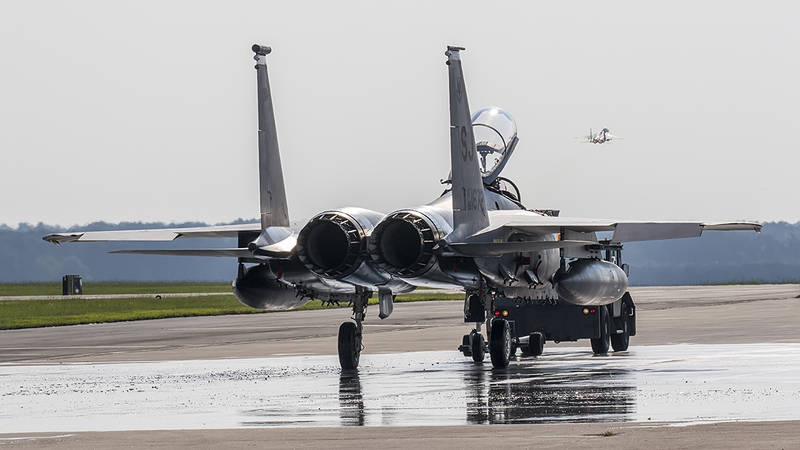 F-15E 4th FW 334 FS starts taxi to EOR prior to launch for training sortie. 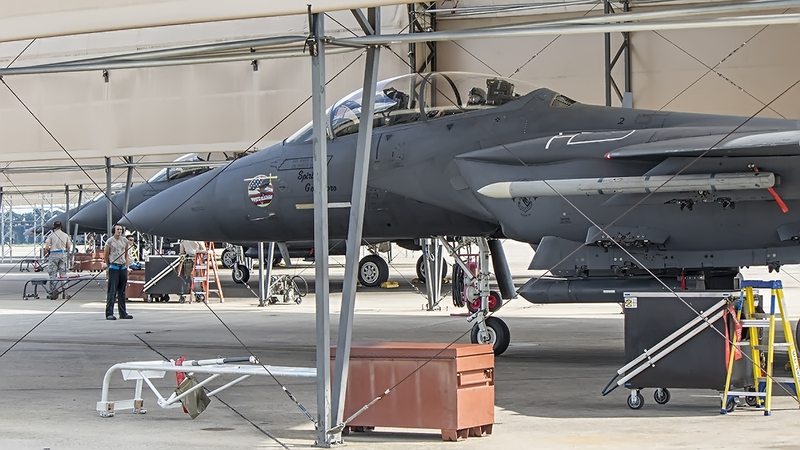 F-15E Strike Eagles from the 4th FW & 335 FS waiting for the go to clear shelters and head to the EOR. 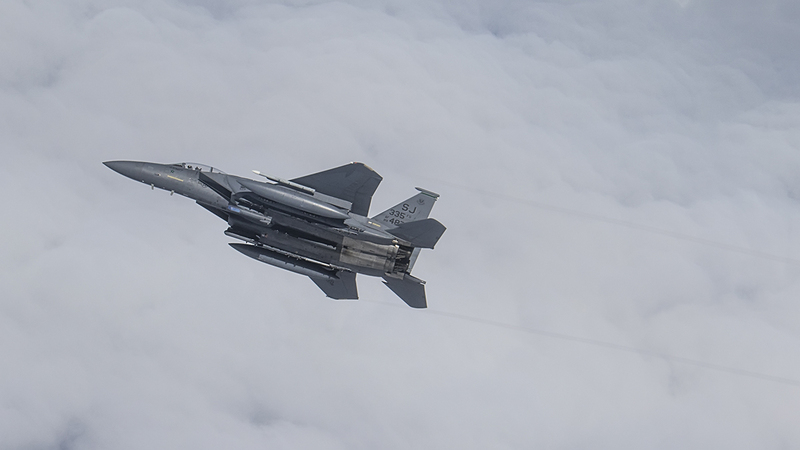 F-15E 4th FW 335 FS "Squadron Jet" breaks away after taking on fuel during Razor Talon. F-15E 4th FW 335 FS "Squadron Jet" just as it releases from fuel boom (note fuel cloud) during Razor Talon. F-15E 4th FW 335 FS "Squadron Jet" taking on fuel during Razor Talon. 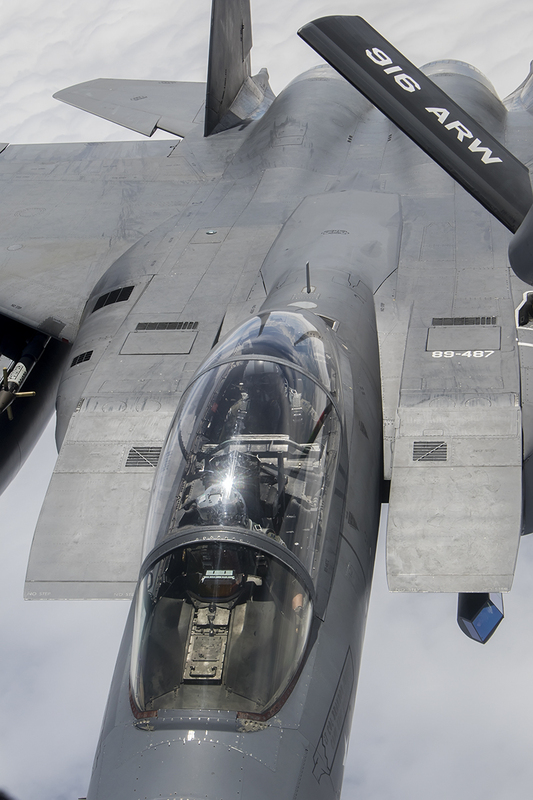 F-15E 4th FW 335 FS departs tanker after taking on fuel during Razor Talon. 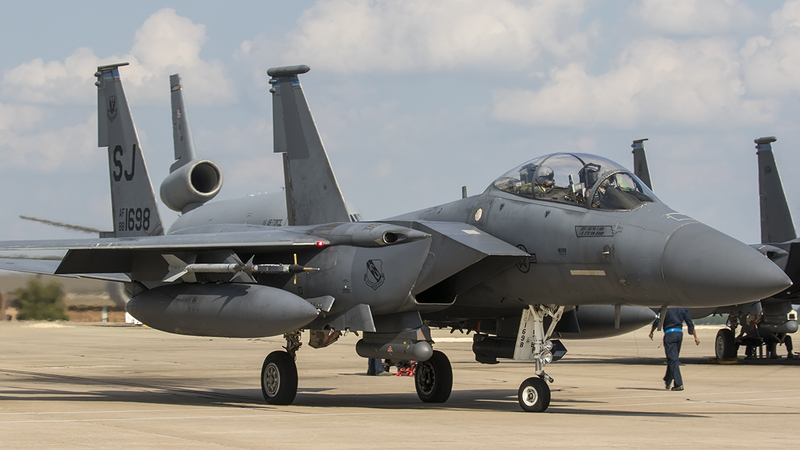 F-15Es of 4th FW Seymour Johnson AFB, under tow & under go! 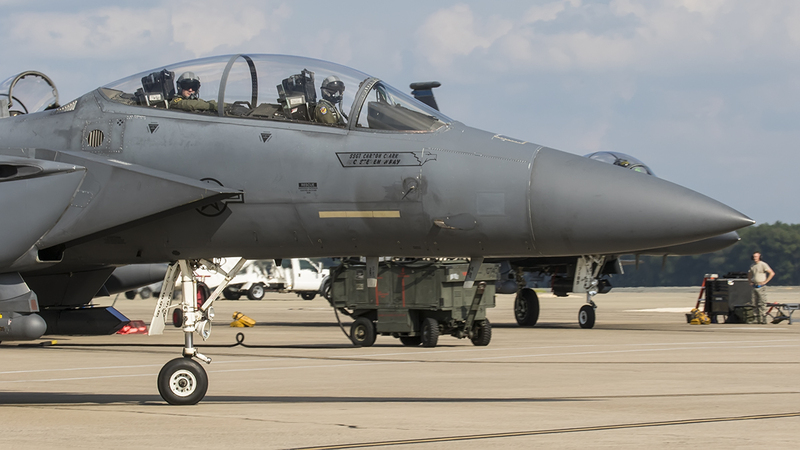 F-15E 4th FW "Wing Jet" Spirit of Goldsboro with 9/11 Tribute on taxi to EOR. 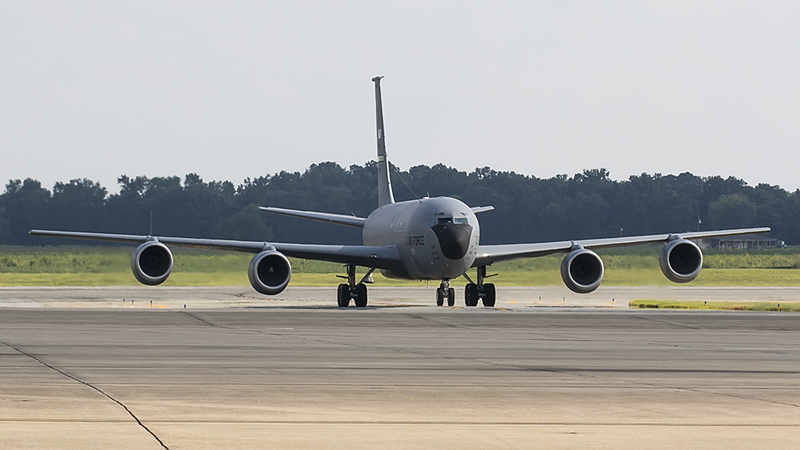 KC-135R of the 916 ARW final checklist before rolling onto the runway for take-off during Razor Talon. 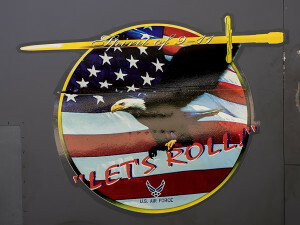 4th FW - Wing Jet - "Rolling!" 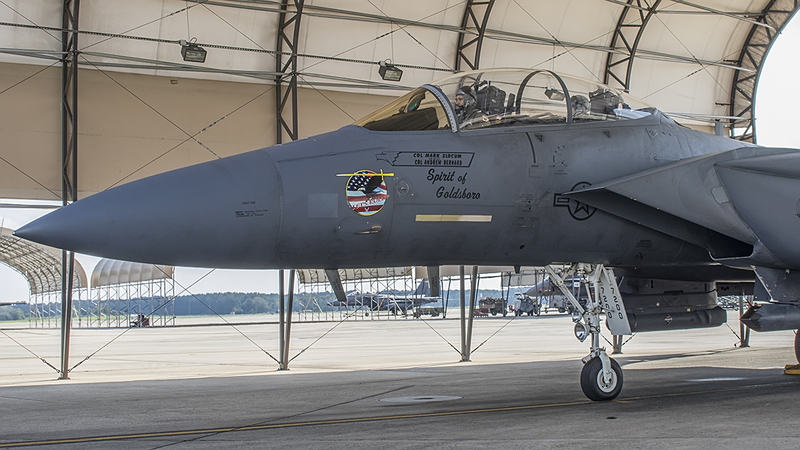 F-15E 4th FW "Wing Jet" Spirit of Goldsboro with 9/11 Tribute waiting "go" for taxi to launch.